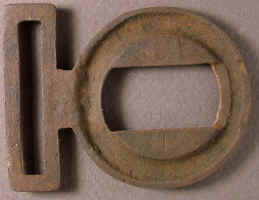 Buckle depicts "CS" and is a two part tongue and wreath plate broadly used in the Confederacy. This style is noted for lettering with small fat letters not proportionate, the top of the S is much smaller than the bottom, wreath with laurel leaves, and plain keepers which are not symmetrical. Plate is cast, tongue disc bar is flat, wreath has a channel around the back side of the wreath. Roman numeral "III" scratched in the back of the wreath is probably a pattern number as it appears in most examples. Plate is believed to have been made in Virginia Virginia during the war and production may have been shared with more than one manufacturer, there can be variations one casting to the next. Ref: Mullinax Expanded Edition, Plate 009. P1113...Confederate tongue and wreath buckle, CS, Virginia style tongue with flat bar, letters not proportionate, keepers are plain, wreath adorned with laurel leaves, cast, Confederate wartime manufacture. Buckle depicts "CS" and is a two part tongue and wreath plate broadly used in the Confederacy. This style is noted for lettering with small fat letters not proportionate, the top of the S is much smaller than the bottom, wreath with laurel leaves, and plain keepers which are not symmetrical. Plate is cast, tongue disc bar is flat, wreath has a channel around the back side of the wreath. Roman numeral "III" scratched in the back of the wreath is probably a pattern number as it appears in most examples. Plate is believed to have been made in Virginia Virginia during the war and production may have been shared with more than one manufacturer, there can be variations one casting to the next. Plate measures: tongue keeper 47.0mm, wreath keeper 50.0mm, wreath height 47.9mm. 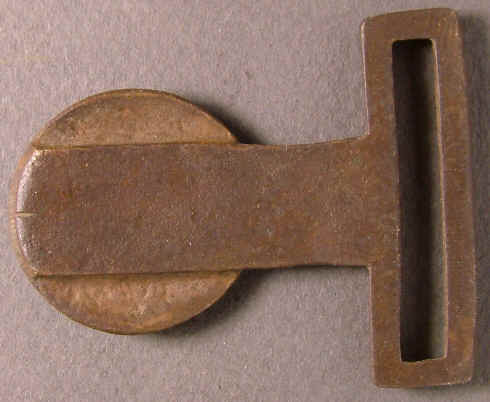 Dug buckle, both halves dug together. Recovered: Brandy Station, Virginia, by Robert Coli. P1967...Confederate tongue and wreath buckle, CS, Virginia style tongue with flat bar, letters not proportionate, keepers are plain, wreath adorned with laurel leaves, cast, Confederate wartime manufacture. 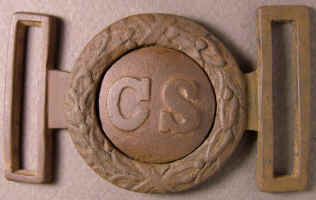 Buckle depicts "CS" and is a two part tongue and wreath plate broadly used in the Confederacy. This style is noted for lettering with small fat letters not proportionate, the top of the S is much smaller than the bottom, wreath with laurel leaves, and plain keepers which are not symmetrical. Plate is cast, tongue disc bar is flat, wreath has a channel around the back side of the wreath. Plate is believed to have been made in Virginia Virginia during the war and production may have been shared with more than one manufacturer, there can be variations one casting to the next. Plate measures, tongue keeper 48mm, approx with bends, wreath keeper 49mm, estimate with bends, wreath 48mm. Dug plate, both halves are believed to have been dug together, fit is perfect, the keepers never seem to match and they did not need to match, they were covered with the belt. Recovered: Orange, Virginia.